Another doorbuster is up at Adorama! They are offering the new condition 1TB G-Technology G-DRIVE, a USB 3.1 Type-C External Solid State Drive in Silver, going for $246 with free shipping instead of its regular price of $350. This is YMMV! While surfing around on Amazon I noticed a new promotion on some product pages. Amazon offers you a discount on products IF you select “No Rush Shipping” instead of a faster shipping option. I tested this with a Prime account, a non-Prime account, and without being logged in, and all three show the same promotion. However, Amazon runs all kinds of experiments on offers, so I have no way of knowing how well spread out these are. Here is an example. You get offered a $10 off discount on the current price of the 2TB Western Digital External Hard Drive. What’s interesting the discount varies. For example, the 4TB is $7 off instead of $10 off. With Black Friday 2017 just three weeks away, perhaps these promotions are designed to help optimize their shipping and delivery? If you like the idea of external hard drives but hate the cables getting in the way, prices of the wireless models have been coming down. 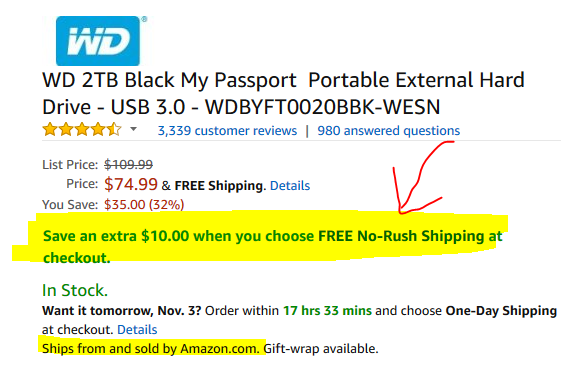 For example, the new condition 4TB WD MyPassport Wireless Pro USB 3.0 External HDD, model WDBSMT0040BBK-NESN, is now under $200, going for $198 with free shipping at Amazon by Amazon itself and at B&H Photo. Speaking of B&H, their Photo Plus specials expire Monday night. On the other hand, if you value speed over wireless, the new condition 240GB SanDisk Extreme 500 Portable SSD, model SDSSDEXT-240G-G25, is going for $100 at Amazon by Amazon itself (limit up to three per customer). All your data is belong to you – as long as you have working backups of them! To the eBay Deals we go where the official Best Buy eBay store is offering the new condition 4TB WD EasyStore External USB 3.0 Hard Drive for $100 with free shipping. Up to three per customer at the sale price. Over 600 units have been sold so far from this ebay listing per the eBay description over there. For a limited time (until 9/30/17 PM), B&H Photo is bundling a FREE 4TB Western Digital My Passport USB 3.0 Secure Portable Hard Drive with the purchase of select Sony a-series full frame cameras at their regular prices: the Sony a7S II Body Only goes for $2500 with free expedited shipping, while the Sony a7R II Body Only goes for $2500 with free expedited shipping. At Adorama, the Sony a7S II Body Only freebie options include Lightroom 6 OR a Tascam DR-10SG Shotgun Mic OR a bundle of photo-accessories including the Corel software bundle. At Adorama, the Sony a7R II Body Only freebie options include Lightroom 6 OR a Tascam DR-10S Mic OR a bundle of photo-accessories including the Corel software bundle. Speaking of Adorama, for a limited time, they are offering the new condition Apple TV 32GB (4th Generation) for $134 with free shipping. Another flash sale is now running at Adorama, for a limited time you can get the new condition 2TB G-Technology G-Drive PRO External Hard Drive with Dual Thunderbolt Ports, 4x 7200 RPM Hard Drives, Up to 480 MB/s, for $200 with free shipping. This is model 0G02828, not to be confused with the non-PRO model which costs less. If you are looking to buy LaCie Thunderbolt 3 Desktop RAID Storage Arrays, eight different models/options are participating in a new Adorama promotion that gets you two free items with purchase: a 2TB LaCie ruggered USB-C External Hard drive and a free Apple Thunderbolt 3 (USB-C) to Thunderbolt 2 Adapter. The free items are listed on the individual product pages while this promotion is running, and will be included automatically by Adorama while the offer is good. No coupon/rebate, just add the main RAID storage array to cart, and the two free items will be included automatically in your purchase. Prices range from four to figure figures for the above LaCie T3 RAID systems. Storage and options are increasing in desktop external hard drives, and if you prefer the 6TB size, the new condition Western Digital MyBook Desktop External Hard Drive (USB 3, model WDBBGB0060HBK-NESN) is on sale for $150 with free shipping at Amazon by Amazon itself and by Best Buy on eBay (limit three as well).